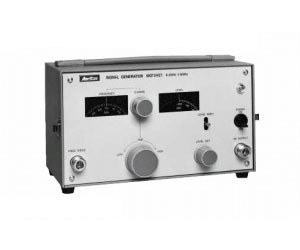 The MG724E1/G1 are a compact lightweight microwave signal generator, designed for medium - and small - capacity microwave line repeater maintenance or adjustment. The instrument is best suited to measure AGC characteristics, squelch function, and signal-to-noise ratio. Its high signal purity and frequency stability also enable it to be used as a general purpose signal source for microwave receiver adjustment on a production line.